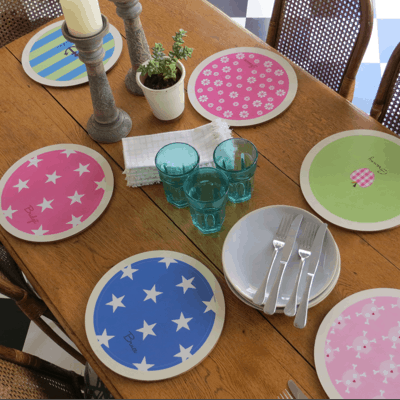 Brighten up the dinner table with these gorgeous personalised placemats. Placemats are 30cm in diameter. Hard-wearing melamine with cork backing. Care: Wipe with a damp cloth. Mats are scratch and heat resistant. 10 designs to choose from. Mats take 3-4 weeks to make so please order well in advance. Placemats are 30cm in diameter. Hard-wearing melamine with cork backing. Care: Wipe with a damp cloth. Mats are scratch and heat resistant. 10 designs to choose from. Mats take 3-4 weeks to make so please order well in advance.